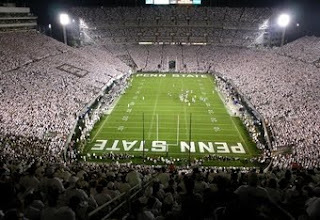 As you probably heard by now, Penn State will not host a night game this upcoming season. The Lions only night game of the year will be at Northwestern on Oct. 22. I'm fine with it. I'm not really sure why this created a bit of a stir on PSU message boards and blogs. PSU hasn't exactly played well under the lights the last few years. Plus getting home at 3am sucked.